The Gay Men's Chorus of Washington began one-week tour in Havana to support the rapprochement between Cuba and the United States started in late 2014. With this unprecedented visit on the island, the male choir wanted to "do something really significant," Chase Maggiano, director, told AFP. "Making a tour to promote LGBT rights in Cuba was a good thing to do at the right time (...) There are many reasons" to be here, he added. "One is the opening of diplomatic relations (scheduled for July 20), which shows Cuba and the United States" in a new light, "as allies in the future." On Monday, the choir performed at the municipality of Arroyo Naranjo, a suburb of Havana, to groups of young people who returned the gesture by offering a dance. "We have many rights in our country, thanks to the decision of the Supreme Court in favor of gay marriage (adopted in late June), but we still have (...) work to do. 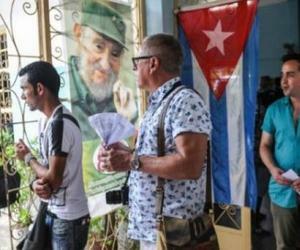 For example, gender equality in Cuba is much stronger than in the United States,“ he estimated.